One of my favorite things in the entire world is when a handful of super simple ingredients work together to create a magically delicious and versatile recipe. Sauteed Cabbage is one of those recipes! I mean, who ever thinks cabbage as a deliciously flavorful food? No one! But when it gets sauteed with butter.. Score With These 8 Easy Tailgating Recipes! Keep the party going with these awesome tailgating recipes! From delicious Baked Cheesy Sliders to Pickle Rollups, you’ll have a perfect crowd-pleasing smorgasbord of snacks and foods for your gathering. 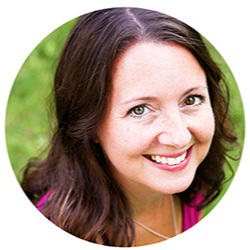 I recently polled my awesome friends on Instagram and said, HEY! What do you people want from me?! In a nice way, of course, because I love my Insta-friends (and all of my web friends). In a nutshell, they told me they'd like to see more dinners and desserts. If our lives had a title right now it would be The Walls Are Closing In. School snacks, backpacks, stacks of papers and piles of laundry litter our RV. There are many signs letting us know this mobile chapter of our lives is coming to a close. Spruced-Up Spaghetti - the perfect use for leftover spaghetti noodles! The clock has been ticking loudly in my aging ears. My 39th birthday is tomorrow, so I am preparing for my last full year of being 30-something. In addition to feeling like the middle ages are looming, this is also the end of the season of having more children. This realization has been unexpectedly sad for me! Do you ever feel like things work out just exactly as they are meant to? I feel that all the time. Like our lives are a pre-written script and we are just living it out. This freelance job I am working on right now fell into place just as Dan's summer employment was winding down.. Somehow it feels odd to be writing about food while sitting in a hospital. Food has been the last thing on my mind for the past few days, although I suppose I have eaten plenty of it. Our friends and family always provide us with plentiful amounts of food whenever we are here. It's nice being able to focus all of our energy on our little boy and to never have to worry about how we are going to sustain ourselves. This is going to be your new favorite sauce - you can add it to grilled meats, dunk your chips into it or slather it on a burger! Loaded with flavor and fresh ingredients, this Creamy Green Chile and Avocado Sauce is definitely blending together. Grill up the main ingredients for a quick turn around for your enjoyment. I need to make more sauces, I've decided. I've fallen madly in love with pesto over the past year, and I've prepared a few delicious sauces to accompany pork. I want to explore more, though. Sauces, like salsas, are incredibly versatile. I love being creative and combining two foods that don't sound like they would taste good together, but actually do. My husband and I made this green chile-avocado sauce and served it with chicken a few nights ago. It was a great match! Very fresh, flavorful and pretty. When I make it again I'll add more spice, but that's my own issue. In my opinion, everything should have more spice. For example Shrimp, shrimp is ALWAYS better with a little bit of a kick. Check out this Spicy Shrimp Pasta if you are looking for dinner with a punch! Brush with olive oil and grill over high heat, turning occasionally, until the vegetables are charred in spots, about 15 minutes. Let cool slightly. Remove ingredients from skewers and transfer to a food processor. Don't forget to remove the peels from the avocados! Process until smooth and season with salt. Serve with grilled chicken. Refrigerate in airtight container for up to 2 days. Delish! Grilling season is finally here! Very fresh, flavorful and pretty! 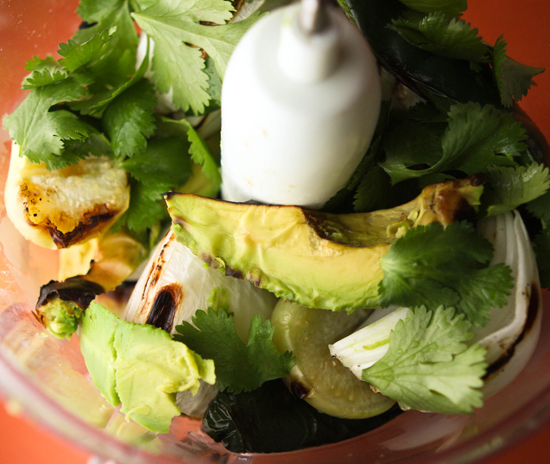 Thread onto four skewers: avocado, onion, tomatillos, garlic cloves, jalapeno pepper and poblano chile. Brush with olive oil and grill over high heat, turning ocassionally, until the vegetables are charred in spots, about 15 minutes. Let cool slightly. Add in the food processor: cilantro, water, fresh lime juice and process until smooth and season with salt. Serve with grilled chicken. Refrigerate in airtight container for up to 2 days. Deliciously fresh, there isn't any harshness in the flavors, and just about anything dipped into it tastes fabulous! I have yet to find a hummus recipe that rivals Sabre's Roasted Pine Nut Hummus. YUM, that is some seriously good stuff. My three-year-old is addicted to it, as am I. I could spread it on pickled beets and find myself saying, "MMMmmmmm!" Ok, nevermind, that is a lie. I hate beets. In my quest to find that one, true, perfect hummus recipe, I have come across a few that are very tasty. This is one of them. The thing I love about this recipe is that it tastes deliciously fresh. There isn't any harshness in the flavors, and just about anything dipped into it (no beets!) tastes fabulous. Garnish with carrot strips and/or lemon peel and serve with assorted dippers, such as pita wedges, crackers, cucumbers, carrots, celery and BOOM! DELICIOUSNESS! If you find a hummus recipe that rivals the roasted pine nut version from the grocery store, will you let me know? Until then check out my version of Edamame Hummus. Deliciously fresh and nothing is off limits to dip! In a small saucepan, cook chopped carrots, covered, in a small amount of boiling water for 6-8 minutes, or until tender; drain. 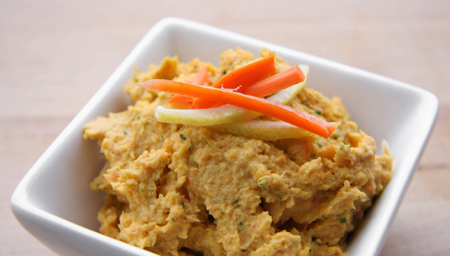 In a food processor, combine cooked carrots, beans, tahini, lemon juice, garlic, cumin and salt. Cover and process until smooth. Transfer to a small serving bowl. Stir in parsley. Cover and chill for at least one hour. If necessary, stir in enough water, 1 tablespoon at a time, to reach dipping consistency. If desired, garnish with carrot and/or lemon peel. Serve with assorted dippers. Time to make your own delicious Edamame Hummus. Garlic, lemon juice, edamame and ginger are just a few ingredients you’ll enjoy the flavors of. This is a simple, healthy snack to have on hand. Yummus Hummus! Hummus will forever remind me of my second pregnancy. I feasted on the stuff daily. I would sit in my little bedrest spot on the couch and eat half of a container of the Sabre roasted pine nut variety, scooping it out with pieces of flatbread. Of course, I could have eaten a lot of things during that time. Ok, I did eat a lot of things during that time. Having recently been given a food processor as a gift (thank you, Husband! ), I am on a mission to create some delicious hummus concoctions of my own. First I want to attempt a few tried and true recipes to get a feel for what ingredients I enjoy the most. I grabbed this recipe out of a holiday cooking magazine and made a few alterations. I love hummus and I love edamame, so I was eager to see how it turned out. I grabbed this recipe out of a holiday cooking magazine and made a few alterations. I love hummus and I love edamame, so I was eager to see how it turned out. I loved it! My husband loved it! My three-year-old wouldn't try it because it was green. He prefers the non-green variety. I found that this was most delicious with vegetable dippers such as radishes, red peppers, carrots and celery. Pita wedges also went great with it. As my three-year-old says, "Yummus hummus!" Looking for another great Edamame Recipe? Check out my Quinoa Edamame Salad, it is packed with fresh fruit and veggies so you can feel free to indulge without the guilt! Thinly slice green onions, keeping green pieces separate from white pieces; set aside. 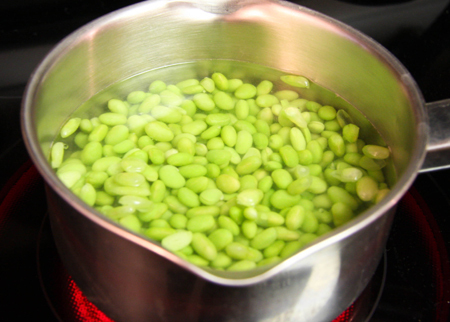 Cook edamame according to package directions, except omit salt; drain. Rinse with cold water; drain again. Reserve a few edamame for garnish. In a food processor, combine white parts of green onions, the remaining cooked edamame, parsley, water, lemon juice, lemongrass, oil, garlic, ginger and salt. Cover and process until nearly smooth. Stir in green onion tops. Transfer mixture to a serving bowl. Garnish with reserved edamame and red pepper flakes. Serve with vegetable dippers and pita wedges. This recipe brings together a great blend of flavors that you actually forget you are eating a super food and it's GOOD for you! Prior to this past summer, I had never knowingly eaten kale. I knew it was a leafy vegetable that could be found in the produce section at the grocery store, and that was the extent of my kale wisdom. Then I took part in a vegetable share and kale started showing up on my doorstep every other week (among many other wonderful veggies). That was my cue to learn more about this mysterious green vegetable. Kale is considered a "super food." That means that it is really, really, really good for you. It is loaded with nutrients such as vitamin A, beta-carotene and vitamin C and other disease-fighting compounds. It is rich in minerals such as calcium, iron, manganese and potassium. Ok, I could go on and on, really. Suffice it to say that it is an amazing food and that it is beneficial to consume it. I found a few different ways to prepare kale, and this recipe is a favorite. It brings together such a great blend of flavors that I actually forget I am eating a super food! Heat 2 Tablespoons of olive oil in a skillet over medium heat. Stir in the chopped onion and 2 minced cloves of garlic. Cook and stir until the onion softens, about 5 minutes. Bring to a boil and stir in 2 bunches of kale, stemmed and torn into medium-sized pieces. Cook for 5 minutes, or until kale is wilted. Stir in 1/4 cup of dried cranberries and continue boiling uncovered for 15 minutes, or until the liquid has reduced to half. Season with a sprinkling of salt and pepper. Prepare to be pleasantly surprised! And then rest well, knowing you have consumed such a nutritious vegetable. For another great way to eat Kale see my Kale Chips recipe, you can eat as many as you want and feel absolutely NO GUILT! Prepare to be pleasantly surprised! And then rest well, knowing you have consumed such a nutritious vegetable. Heat olive oil in skillet over medium heat, stir in chopped onions and minced garlic. Cook and stir unitl the onions soften, about 5 minutes. Bring to a boil and stir in kale, stemmed and torn into medium-sized pieces. Cook for 5 minutes, or until kale is wilted. Stir in cranberries and continue boiliing uncovered for 15 minutes, or until the liquid has reduced to half. Season with Salt and Pepper and serve.